This Maps Menu gives direct acces to all Great Wall of China Maps used in the China Report Web-site, as well as various maps directly relevant to the Great Wall of China and its pathway through northern China. Maps o/t Great Wall of China in Tianjin City Prov. 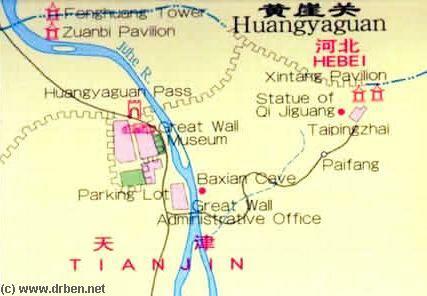 Complete Background info, travel directions, tips and a Site Map of the Yellow Cliff - HuangyaGuan Great Wall of China Site, technically located in Tianjin City Province, but reachable from Beijing. Read the Introduction to the two sections of Yellow Cliff Wall in County of Tianjin; HuangYaguan and Xiaopingan Village also known as the Taiping Zhai Revolutionary Stronghold. Find Bagua Village, Ju River, Xintang Pavilion, Zuanbi Pavilion, the Statue of General Qi Jiguang and More. The China Report introduced on Levels of its Online Publishing's in April of 2009, including the City of Beijing. A Schematic Map overview of Great Wall locations and sections in Shanxi Province, Hebei Province, Beijing City Province, Tianjin City Province and parts of Liaoning Province. This Schematic Map focusses on the seperate visitable Great Wall of China locations and sections within the depicted regions, and includes as the Main Monuments and Scenic Sites in their vicinity as well. 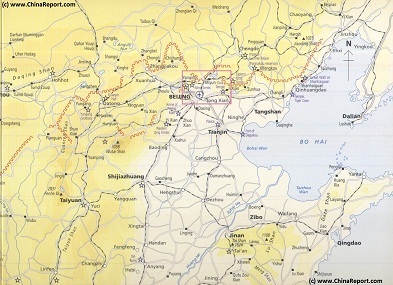 Find the locations of the Great Wall of China in northern Shanxi, the famous fortified "Heaven's Gate" (Kalgan) Fortress in northern Hebei Province, the "First Gate under Heaven in the East and the Terminus of the Inner Layer in the East (Laolongtou) and several often overlooked sites in Liaoning Province. Below is a listing of all ChinaReport.com Maps relevant to the Great Wall of China in Tianjin City Province (and adjoining regions).